How can your school and students get involved in National Skills Week 2018? Start planning an event now! ● VET skills challenge – ​As a class, students workshop and plan a particular VET skills challenge. Construction – Simple project WorldSkills style competition. ● Mini VET Careers Expo – ​Students work in groups to research an industry and prepare a career expo stall with pictures, video and research regarding the industry. Students set up their expo stalls in a large space for younger students, parents or industry visitors to attend. Industry visitors may be invited to assist students in their stall presentation. Encourage students to get creative by what they offer at their stall to engage attendees’ interest, in particular, showcase aligned VET skills. 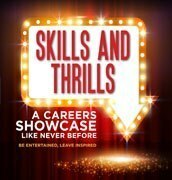 Industry representatives may also award prizes for the stalls​ ​eg most informative stall, most ‘unusual industry’ stall, best VET skills showcase or most creative stall. ● Dream it, be it! – ​Students prepare a short individual presentation on a career that interests them which includes pictures, videos, interesting research and links to skills and VET pathways. They present their finding to peers, younger classes and/or parents in the work attire of the industry. ● Work placement/work experience coffee table book –​ Students each contribute a 1 page report of their work placement/work experience detailing information about the organisation, what they did in the workplace, skills demonstrated and reflections on the potential career pathways (including VET options). All reports are collated into a coffee table book to be used as a resource for future work placement/work experience students. It may also be a resource kept in reception for visitors to your school to review. VET Business Services students may assist in the design and formatting of the coffee table book. ● Focus on employability skills –​ Use a skills framework such as Core Skills for Work https://www.education.gov.au/core-skills-work-developmental-framework​ and organise sessions which develop students’ understanding and demonstration of these skills. Encourage students to reflect on their own employability skills and how these can be communicated in their resumes. Invite an employer to discuss why employability skills are so important in the workplace. ● Spotlight on SBATs – School based apprenticeships and traineeships (SBATs) are an opportunity to gain a VET qualification and undertake paid employment as part of the Higher School Certificate. Facilitate current and previous school based apprentices and trainees to talk about the program and their experiences. It’s also an opportunity to invite the local SBAT representative to discuss how to get started. Work with the class to scaffold a series of questions to the guests and encourage them to ask their questions in front of peers. If the experts can’t be there face to face, look at how Skype or Videoconferencing technologies can be used to bring industry experts to school! ● Employers breakfast – ​Use National Skills Week as an opportunity to invite industry and Australian VET Alumni to the school to develop schools/industry partnerships. Target organisations that students are interested in finding out more about or where they might like to work in the future. An event such as an Employers Breakfast is also an opportunity for the VET Hospitality class to showcase their VET skills by providing catering. ● Out and about –​ Workshop with the class a school excursion to visit industry/employers to inspire students career pathways. Encourage exploration of opportunities not thought of before and for students to make contact and drive the agenda of the excursion. ● Family career maps -​ Ask students to map a selection of family members’ career pathways to present to peers. Example Dad: Completed a glazier apprenticeship after 4 years, worked with Johnson’s building supplies as a glazier for 7 years, opened his own business as a handyman, and is now his own boss. Students may illustrate their presentation with photos, videos, artefacts from different industries. ● Contact your local Rotary Club, many of its members are small employers and local business people, Rotarians are always willing to help, provide some ideas and support. Don’t forget your local community newspaper, let them know what your students are doing, get some positive publicity for your school, your students and your event. ● Here are some additional useful websites , encourage students to research, find something that inspires them.